5 steps to improve your drawing skill fast. Drawing tutorial and Tips. 1) Draw! You have to spend at least 2 hours a day drawing everyday. You can either draw from things you see or things you think of, . *Remember, when you are a professional, you will be drawing at least about +8 hours a day. * You have to practice a lot to become art ninja. 2) Go to life drawing session at least ONCE a week, better yet twice if you can make it. Just search internet for life drawing session near you. The session usually last about 3-4 hours. 3) Practice drawing from cast and simple object around the house to study value and squinting to find basic value of the subject. The trick is find objects that have different reflective quality such as teapot, ball, satin, flower then observe and sketch them. 4) Study from any old school master sketches (Mucha, Sargent, Zorn, or whoever is you favorite artists) and try to mimic the piece. You will intuitively learn and try to figure out how they did what they did. The more you do the better you will get. 5) Practice drawing using different medium and switching them around and know how you can work with them, get out of you comfort zone. Try different pencil, graphite, charcoal, pen, markers, brush pen, brush, etc. Anything you can find...use you imagination and let the tool be your best friend. That's about it...for now. If you consistently do this for about three months, you be surprise. I suggest after about three months compare your first drawing when you just start doing the routine and you last drawing. You will then see what I am talking about, your skill has just been elevated!!! Congratz! Don't give up to early, once you stop drawing...doesn't matter where you were, your skill will somehow drop. A drawing takes time and consistency to develop. Don't be discouraged by the result if it doesn't come out like what you are looking for, make new ones. It's the journey itself, not really the destination. And any time you don't feel like drawing or you have artistic block go read this! 10 ways to overcome artist's block It will surely help you get back on track! - How to draw Lara Croft Tomb Raider. - How to draw hair. - How to draw eyes. - How to draw nose. - How to draw lips. - How to draw human's head. - How to draw man's body muscle torso. 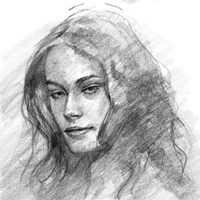 - How to draw realistic portrait front view. - Thor digital painting tutorial. - Environmental concept tutorial mountain and water. Thanks Xia, these are extremely useful, best tips I've read in months! Thanks man! I will try to research, come up and post more stuff like tips and technique. Glad you enjoy this. n00b at drawing,I am very thankful to what you have done.Thanks for teaching me how to draw fimale and use my imagination!Its an honor to learn from you! Sven>> Thank you! I hope we can help you do that. NEVER be discourage! Talented alone is overated, practice and discipline will make you the better artist and talent will come along with it. man found your website from the video links in face book, if u do get some free timecan u plz add me so that i can show u my art work and get it evaluated and some help perhaps... depends if u get some free time that is..
gaara> Thanks brother. Glad I can help, but we can help you more on the community. Share your drawing and art with us, I just send you an invite via e-mail. I got a (for me) important question for you : i started digital painting (especially concept art, cause it's really cool) and i bought for the beginning a Wacom Bamboo ONE. This is a very small paint tablet with just a small surface and a pen. So i read a lot about other, better tablets. Now my question is : Is it really necessary to buy a expensive tablet like the intous3 or has it something to do with your hands (like moving the hand or looking for a good position). I know that i can learn ALOT with practicing, but im just wondering if its better when you have a bigger and better tablet. Hello :), I like to say thanks to you because this blog is a really good help for me, I'm a young artist and I'm getting better thanks to you.. I found one of your video on Youtube yesterday while looking for prop designing and concept art, and got onto your blog from there. Your videos are very very helpful, your blog is extremely informative and encouraging. I have almost stopped drawing for practice and I can see how week my lines have become but starting back again. Look forward to more videos and articles on your blog. Thanks a lot! i have watched 20+ of your videos you have greatly improved my drawing skill! i am so glad i found your site! i am now reinspired to draw. i cant stop drawing now. everything i look at i imagine what it would look like and how to draw it! thank you so much! This is exactly what I need, great thanks! Thanks for the great advice Xia! :) Now I have to go draw!